It’s hard to believe we’re almost half-way through the year. 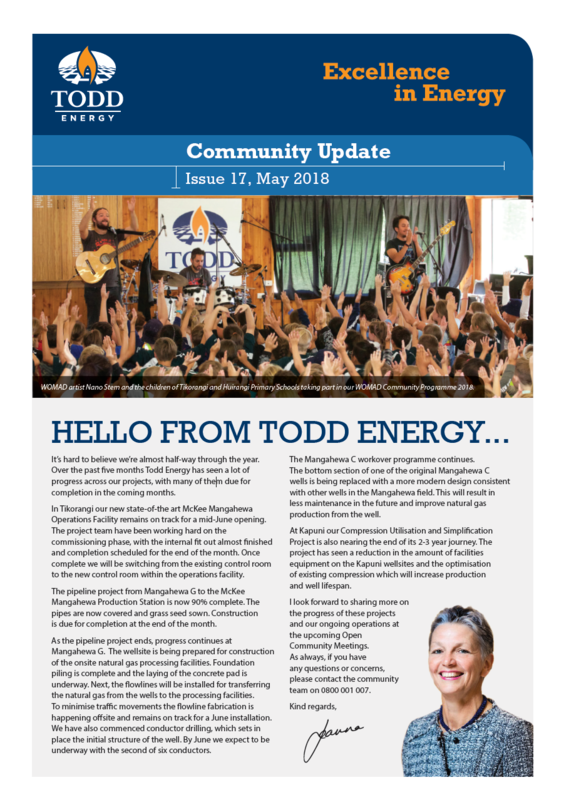 Over the past five months Todd Energy has seen a lot of progress across our projects, with many of them due for completion in the coming months. In Tikorangi our new state-of-the art McKee Mangahewa Operations Facility remains on track for a mid-June opening. The project team have been working hard on the commissioning phase, with the internal fit out almost finished and completion scheduled for the end of the month. Once complete we will be switching from the existing control room to the new control room within the operations facility. The pipeline project from Mangahewa G to the McKee Mangahewa Production Station is now 90% complete. The pipes are now covered and grass seed sown. Construction is due for completion at the end of the month. As the pipeline project ends, progress continues at Mangahewa G. The wellsite is being prepared for construction of the onsite natural gas processing facilities. Foundation piling is complete and the laying of the concrete pad is underway. Next, the flowlines will be installed for transferring the natural gas from the wells to the processing facilities. To minimise traffic movements the flowline fabrication is happening offsite and remains on track for a June installation. We have also commenced conductor drilling, which sets in place the initial structure of the well. By June we expect to be underway with the second of six conductors. The Mangahewa C workover programme continues. The bottom section of one of the original Mangahewa C wells is being replaced with a more modern design consistent with other wells in the Mangahewa field. This will result in less maintenance in the future and improve natural gas production from the well. At Kapuni our Compression Utilisation and Simplification Project is also nearing the end of its 2-3 year journey. The project has seen a reduction in the amount of facilities equipment on the Kapuni wellsites and the optimisation of existing compression which will increase production and well lifespan. I look forward to sharing more on the progress of these projects and our ongoing operations at the upcoming Open Community Meetings. As always, if you have any questions or concerns, please contact the community team on 0800 001 007.